Opened in Summer 2014, Trillium North Park is on the south edge of Strathcona neighbourhood; for millennia three Coast Salish First Nations: the XwMuthkwium (Musqueam), Sḵwx̱wú7mesh (Squamish) and Tsleil-waututh exercised overlapping traditional rights to the land on which the new Trillium North Park is situated. This new park’s perennial plantings were chosen for significance in traditional hand technology by First Nations People from across the province of British Columbia. Purpose-designed areas assist in processing plant materials including: covered harvest table and work area, shipping containers for indoor work, fenced outdoor storage and an open-air performance space. The park is approximately 1 hectare in size. Certain areas of the park are managed by the non-profit organization, eartHand Gleaners Society with the intention of teaching skills in sustainable harvesting, crop management and hand skills in using the plants harvested from the park. We want to make Trillium North what urban sociologist Ray Oldenburg calls a ‘Third Place’- a great, good place that acts as a sphere for community happenings. We are thrilled to have Environmental Youth Alliance join us as partners for pollinator related programming, and to continue working with the Vancouver Park Board: Arts Culture and Environment team. Find us at the corner of Malkin and Thornton Street- just south of Prior street. by bike – turn south at Jackson from the Union Bike route- cross Prior Street and coast up to the shipping containers. by skytrain and foot– 900 meter walk from Main street skytrain, head north east, take the back road along National and turn left just past the soccer fields. by bus- the # 51364 stop on Prior is very close- serviced by the #22 downtown or MacDonald. Less then 5 minute walk south along Malkin and into the park. Despite the seemingly unending rain we have been having a few good-often impromptu-garden or play sessions at Trillium North the last while. If you have wandered by, you may have seen evidence of some of our work; weaving new borders, improving the compound structure for supporting rain tents and more. Here are a few dates we know we will be there rain or shine, so come join in! Saturday April 29th 10am-12noon: weaving borders, spreading woodchips and doing a serious weeding and some seeding in the native swale zone- with assistance from Environmental Youth Alliance’s Native Nursery Program. Saturday May 13th 12noon-3pm: Community Dog Groom and Spin-a-Long! Did you know that the Salish Nations kept dogs as fibre resource– not pets? Alas those dogs are now extinct, but on this day we turn our attention to our furry friends that live with us now, and invite any dogs with an undercoat being shed to come to the park, leashed and with their humans and a brush. Spinners will be standing by to sample the coats! 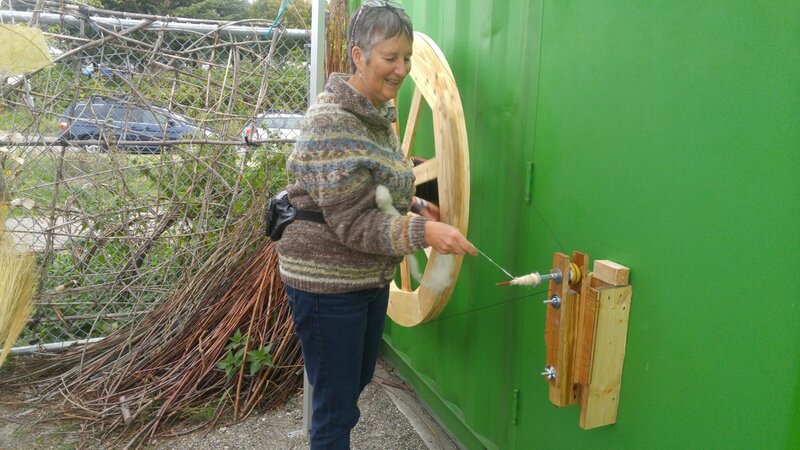 Learn how to use a drop spindle, sample how fibres are blended, and try out our great wheel- with another local urban animal fibre- mane hair from the horses at the race track! 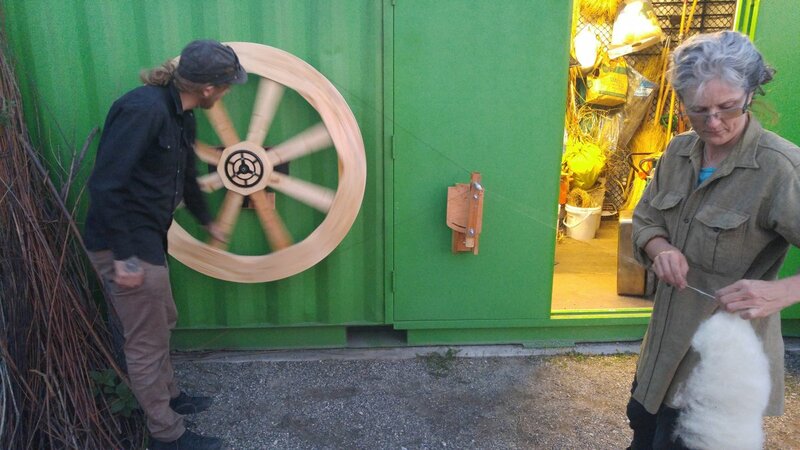 The wheel is complete and installed in mere moments for our spinning pleasure, the rain catchers is done ( with rain barrel already full) and the Festoonery fence piece shall be completed soon! 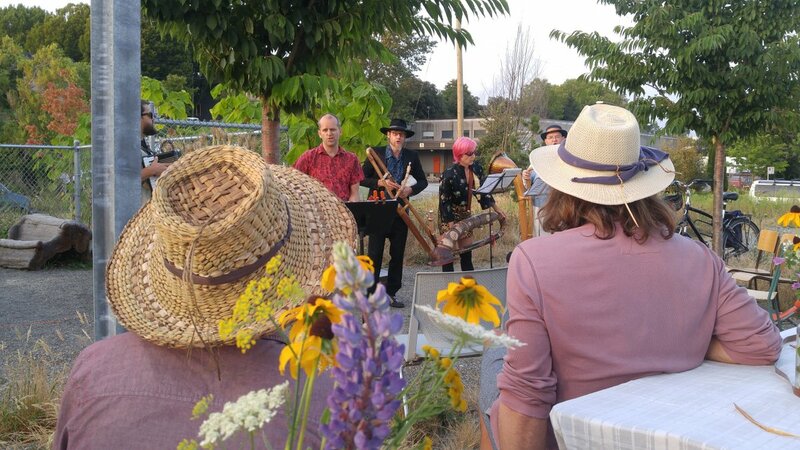 Spin linen on the walking wheel, make kites for the Soil to Sky project, crochet on the fence, hear the Hastings Street Band and warm up in our nourishing tea space. Announcing a new project for the Fall of 2016 at Trillium North Park. Three local artists, Melodie Flook, David Gowman and Arlin ffrench, will be joining us at our work space at Trillium. 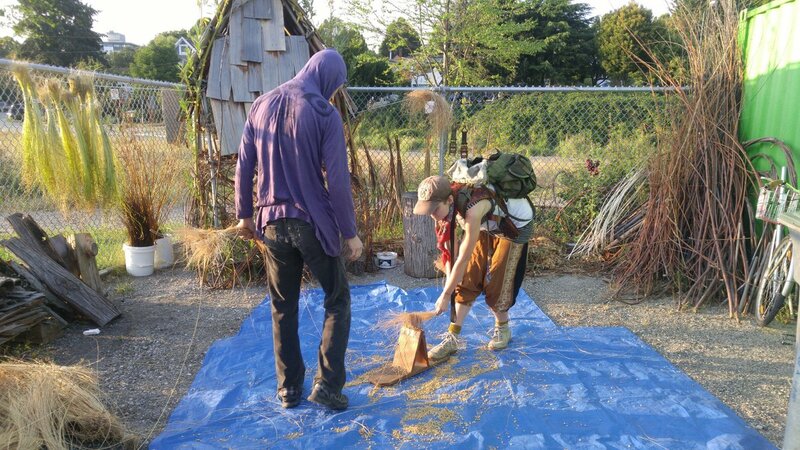 The group projects to be undertaken include collaborative fence weaving using local plants (Festoonery), a handmade rain catchment system carved from local trees (Rain Collectors) and a walking-spinning wheel for ongoing community use. These site-enhancement projects will add to our ongoing creation of a beautiful, inspiring and “made-by-hand’ environment; an oasis of creativity and community in this urban, industrial and reclaimed green-space. All of these projects have room for community participation! The project includes instruction in rope-making, crocheting, knitting and lace patterning. Over the course of three Sundays in September, a rain collection system, made from locally grown/harvested wood, will be built and installed by volunteer participants at Trillium North Park. Stage one: Shaping. Using advantageous, pre-bisected empresswood staves, gutters can be hollowed using gouges and mallets. Brackets for mounting can be cut and shaped using hand tools (pull saws, coping saws and chisels). Step two: Sealing. Once the parts are shaped, a layer of oil-based sealant is applied to the waterway (in this case, a bright red for aesthetic appeal). Upon curing, a further layer of varnish is applied to all parts prior to installation. Step three: Installation. The Rain Collector Project is installed using common hardware (stove bolts and pipe clamps). Anchor holes are drilled into the shipping container walls. Brackets are mounted with wooden backings on the inside of the container. The gutter race down to the rain barrel is mounted onto the fence using wooden brackets, wood screws and pipe clamps. Arlin is working with a group of spinners as collaborative consultants in the community to create the wheel. 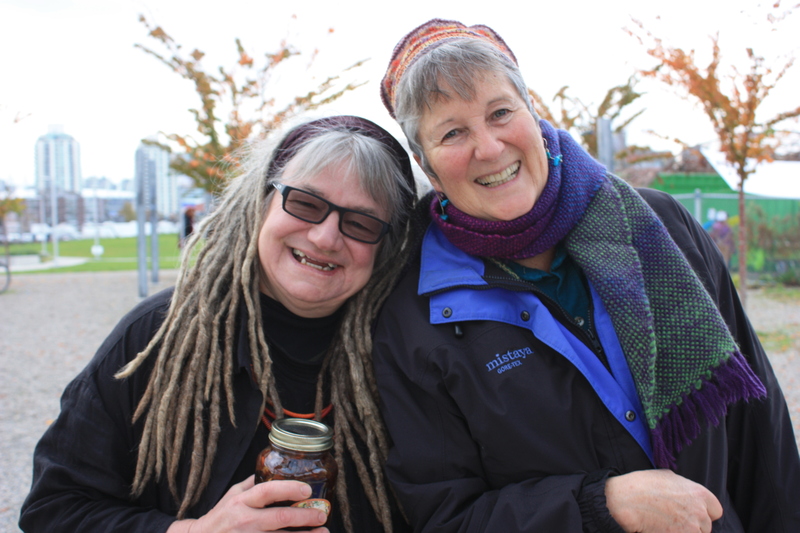 Public work dates tba, spinning demonstrations at Final Celebration October 1st. FOR CULTURE DAYS: Join us Saturday October 1st from 1-4pm to participate in the Festoonery project, sample the walking wheel and see the new rain catchment system in place! Thanks to Vancouver Park Board: Neighbourhood Matching Fund for making this project possible. Paid workshops getting started for the season soon! As always, paid program placement supports sponsored spaces in our programs when our class minimums are reached. 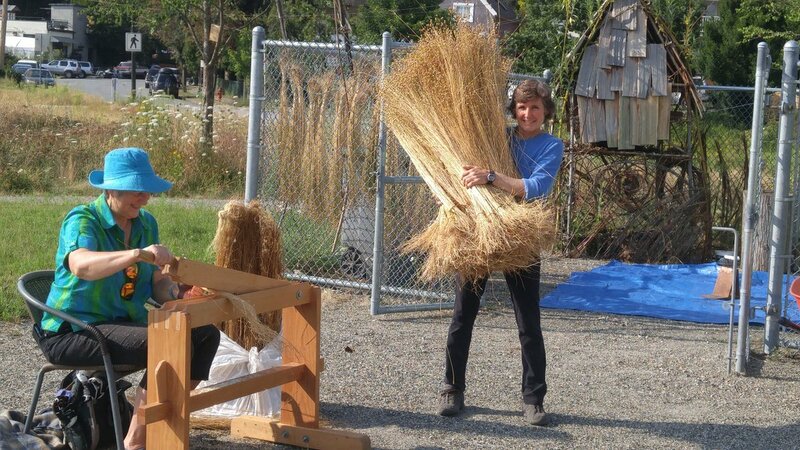 Melodie Flook is spending evenings this summer making rope from local plants, then crocheting and knitting the rope into the west side of the chain-link fence at Trillium North Park and would love your help! No tools or experience is needed. Trillium North was lucky to be one of the places that Erin Udal from Environmental Youth Alliance led a group of Citizen Scientists this past spring. Here is the report just in on what we found! March was a very busy month- though Spring Break kept the kids away near 3 weeks, we had other community stewardship times that happened during the holiday and adults, families and students alike helped with lots of planting, transplanting, sowing seeds and weeding- you can read about it stacked in the Seasonal Almanac Residency Page- under March, or click here!